Today starts another challenge at One Stop Craft Challenge and the theme of this challenge is food and Drink. So go over to http://www.onestopcraftchallenge.blogspot.com/ to enter your project today. 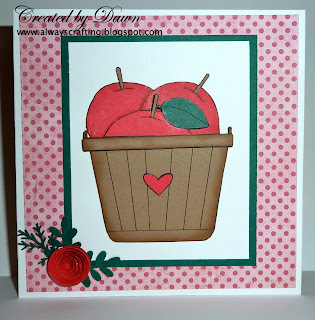 I was given a lovely image of a basket of apples to use for this challenge. I decided to make the basket and apples have dimension so I used paper piecing and pop up dots to achieve this look. The flower is made using a MFT die.